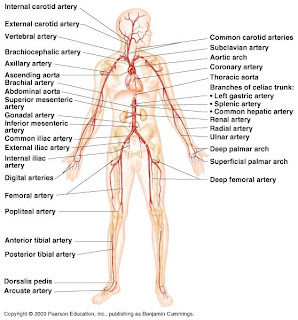 It took a little bit of searching, but I found a few sites that have great illustrations showing the arteries and veins. Take a peek and see what you think. The first link has an incredibly long URL, but it has tons of anatomy and physiology info on it. Double click on the image on the left and you should be able to save and print it. This site is pretty detailed as it comes from the Department of Bioengineering, but it has a few great illustrations of arteries and of veins. There is also a few diagrams of the heart which are very clear.